The Wind Rises is like a gale of emotion, both haunting and enchanting, a meditative film that is all the more poignant considering it’s most likely Miyazaki’s last. It’s easily one of my favorite of his films, even though it lacks many of the fantasy elements which I’ve come to love in his work, and I’d go so far as to say it’s one of my favorite films of the year. Based in part on the life of Jiro Horikoshi who designed the Mitsubishi A5M fighter and its successor, the Zero, both of which were used by the Japanese Empire, it’s a compelling look at Japan’s past and a historical journey into the struggles that shaped the era. At the same time, it’s also about a brilliant designer whose passion for all things aviation causes him to see patterns that others are oblivious to, even in the fish bones of a mackerel that are part of his meal. A big part of the journey lies in his dreams and that’s where elements of the fantastic emerge. Even as a kid, he dreamed of flying. It’s when the fantasy starts blending into reality that the intersection makes us marvel and wonder at the insights Miyazaki is sharing about his own animating process. We got a glimpse into that process in the documentary about Studio Ghibli, The Kingdom of Madness and Dreams. All creativity requires buckets of madness as well as fusillades of dream-infused creativity. The emotional arc and the subtle interplay of Horikoshi’s life is often understated, understandably so, as much of his odyssey is subconscious, an aerial wonderland that is optimistic. The choice of Hideaki Anno for the voice actor was inspired, especially considering he’s the director of Neon Genesis Evangelion, one of my favorite series of all time. I’ll admit, at first his voice was jarring as it didn’t fit my expectations for the bright-eyed engineer. But it grew on me with its subdued quality, a complex mix of forcefulness, submissiveness, and eclectic whimsies. By the end, I couldn’t think of anyone else who’d be a better fit. A theme that pervades throughout is the wind, or fate’s role, in salvation, disaster, and even random encounters. His first meeting with his future wife, Nahoko, happened because of the wind (I won’t spoil the specifics, but it’s a fun scene). When the Great Kanto Earthquake of 1923 hits, the strong winds play a big role in spreading the fire. I loved the way the history plays such a key role, and yet never overtakes the main story. Even with momentous events occurring, the characters remain at center stage. Miyazaki said he was inspired by the real Horikoshi’s quote: “ All I wanted to do was to make something beautiful.” All of Miyazaki’s works are undoubtedly beautiful. But there’s something even more meaningful in this one, almost Ecclestiastical, the wise sage sharing a part of his life, trying to pass along a little bit of the magic he’d weaved and spread to us ‘mere mortals.’ That magic becoming corrupted and misused becomes the tragic turning point in the plot, and I found Jiro’s plight moving as his love for planes leads to them being used in war. I’ve heard there was some controversy over the humanization of the man who developed the Zero which killed so many people in WWII, and that’s an entirely different conversation in itself. For the purposes of this post, I want to limit myself to the actual film and thoughts on Miyazaki himself. In The Kingdom of Madness and Dreams, one of the interesting juxtapositions is between Miyazaki and director Isao Takahata, who lived through a US air raid in Okayama City when he was a kid. Miyazaki talks about how his father gave a family some chocolate, and how all these decades later, they were still so touched by that. He then reflects on Takahata’s own bitter experience after the raid and how that changed so much of his outlook on life even to this date. That contrast was never more apparent than in The Wind Rises versus Takahata’s own war film, Grave of the Fireflies. I’ll be honest here. To this day, I have not been able to finish Grave because it gets me so emotional. I have a general idea what’s going to happen by the ending, and the story is so depressing, I just can’t do it. It’s funny because when I was in my early 20s, an older colleague I knew said he no longer watched sad films since life already had enough sadness. I didn’t understand him when I was younger, but now, I can understand his viewpoint, even if I don’t necessarily agree. I still watch a whole lot of sad films, The Wind Rises having its own share of sorrows. But Grave of the Fireflies is one of those films I still haven’t been able to finish because it’s so bleak, even if it’s a beautiful despondency. In The Wind Rises, Jiro is faced with the misuse of his creation, the death of his wife, and his homeland in ruins. Yet the message is still one of hope. It’s all the more striking when I learned Miyazaki’s original ending was his wife saying, “Come,” to join her and depart the world. Instead, Miyazaki changed it so that Hiro is given the exhortation to live, to go on, despite the horrible circumstances. I think a huge part of what has made the movie so much more powerful is that it came after the personal journey I’ve had with United States of Japan, immersing myself into Japanese culture and its history. It has my thoughts on mortality and how our attitudes towards death change with age, especially as that remaining clock time gets shorter and shorter. You don’t have time to think about it when you’re younger. But as age piles on, it becomes a bigger preoccupation. Miyazaki is reflecting on the many dichotomies of his life. The shades have all sorts of permutations, meanderings, and reflections. And while The Wind Rises doesn’t have the tight structure of his previous films, this feels much more like the dream of a biography, not so much of Miyazaki’s personal history, but rather his beliefs and philosophy. His passion for detail shines through in this engineering love letter to all things planes, as endearing as his bond with Naoto. Animation is as much a craft as it is an art, and the nitty gritty of the techniques would be obscure to those who aren’t versed in the details. But just as Jiro’s hands are never far from a ruler, Miyazaki’s love for his craft shines through more so than in any other film of his. It’s no wonder The Kingdom of Madness and Dreams states multiple times that he had a hard time approving the final look for the Zero. It’s a state of existence that only he can hear, breathe, see, and perfect. 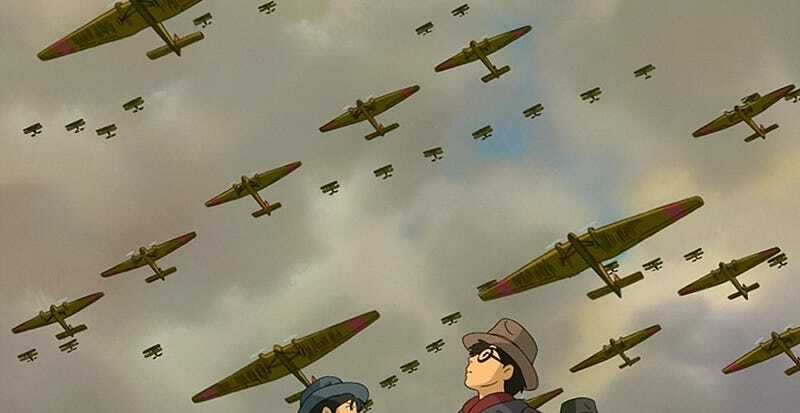 In the end, there is a serenity in The Wind Rises, a desire to simultaneously submit to the wind while also riding it with our own inventions and creations. It won’t be for everyone and Miyazaki refrains from any absolute stances. But his truths lie somewhere in the wind. Even if you find you don’t like it, come back to it in a few years. It’s one of those films that has all sorts of layers streaming into each other that aren’t so much about reaching the finish line as it is basking in the wind and letting it takes its course. Peter Tieryas is the author of United States of Japan and has written for places like Kotaku, TAY, and Tor. This essay is an expanded version of a piece that was first on his blog. You can find him musing on airplanes on twitter at @TieryasXu.